Extensive epidemiological investigation followed by prevention and treatment interventions have largely succeeded in controlling an outbreak of HIV and hepatitis C virus (HCV) infection in rural Indiana, USA, linked to injection of prescription opioids, but new cases continue to appear and many other communities may be at risk for similar outbreaks, according to presentations at the Conference on Retroviruses and Opportunistic Infections (CROI 2016) last week in Boston. John Brooks of the HIV epidemiology team at the US Centers for Disease Control and Prevention (CDC) gave an update on the evolving Indiana HIV outbreak among people who inject drugs at a plenary session on the final day of the conference, while Sumathi Ramachandran discussed how genetic analysis shed light on HCV transmission networks involved in the outbreak. As background, Dr Brooks noted that, at the end of 2014, “things looked pretty good for people who inject drugs” in terms of HIV, as incidence had declined dramatically in this population and people who inject drugs accounted for only 6% of new infections in 2014 – down from around 30% in the early 1990s. But in January 2015, the Indiana State Department of Health began investigating an HIV outbreak after epidemiologists confirmed nearly a dozen new infections, primarily among people who inject drugs, centred around the town of Austin (population 4200) in rural Scott County, which had less than one case per year during the previous decade. Indiana and CDC investigators published an initial report on the outbreak in the May 1 edition of CDC’s Morbidity and Mortality Weekly Report. Dr Brooks previously presented an overview of the Indiana cluster at the International AIDS Society conference last July, describing efforts to determine the source of the outbreak, trace patterns of transmission, halt further infections and bring affected people into care. Newly diagnosed individuals were asked to suggest any injection or sexual partners or other social contacts they thought might benefit from an HIV test. Of the nearly 500 individuals so identified, by mid-June 170 people were found to have HIV, 90% of whom also had HCV. The outbreak then slowed, but a small number of cases continue to be identified. A “retesting blitz” in November picked up some new cases, and the Indiana health department announced last month that four recently confirmed cases had brought the total to 188. The recent cases were mostly among people who had not been tested during the earlier round or were tested upon incarceration, Dr Brooks said, but one person who had previously tested HIV-negative had become positive. HIV prevalence is now 4.6% in Austin and about 1% in Scott County – comparable to hard-hit cities like New York City and San Francisco. This outbreak differed in several ways from others previously seen among people who inject drugs in the US. The newly diagnosed population is rural, almost all white, and includes a substantial proportion of women (42%); the median age was 34 years. Dr Brooks noted that in some cases drug use was multi-generational, with “parents, children and grandchildren injecting together”. In contrast, prior outbreaks have traditionally involved inner-city residents, a majority African-American or Latino, with nearly twice as many men as women. The Indiana outbreak goes along with a trend of rising drug overdose deaths in the US that now exceeds traffic fatalities, primarily due to prescription opioids and heroin and often affecting rural and suburban communities lacking harm reduction services (described in the January 1 Morbidity and Mortality Weekly Report). Like Scott County, affected communities typically have high rates of poverty, unemployment, low education levels and limited access to insurance and health services. The combined local, state and federal/national response to the Indiana outbreak included linkage to HIV care and antiretroviral therapy (ART), offering pre-exposure prophylaxis (PrEP) for people at ongoing risk, helping people access hepatitis C therapy and offering medication-assisted treatment for drug addiction. “We tried to get many people on ART to reduce community viral load – that’s the most potent prevention intervention we have,” Dr Brooks stressed. In addition, PrEP is being provided to people who inject drugs and their sexual partners, and he said there is greater interest and more people asking about it. In the announcement about the four most recent cases, the Indiana health department urged people at risk to ask their healthcare providers about PrEP. As part of the response, Indiana declared a public health emergency that allowed local governments to establish otherwise-illegal syringe exchange programmes. As reported at the IDWeek 2015 conference last October, implementation of an emergency syringe programme serving Scott County led to a decrease in risk behaviours including needle sharing in its initial months. Dr Ramachandran from the CDC’s molecular epidemiology and bioinformatics team described how investigators used HIV and HCV molecular testing to better understand the Indiana outbreak and where it was heading. To characterise circulating HCV, they performed molecular analysis of nearly 500 specimens. HCV strains were genotyped using phylogenetic analysis of NS5b sequences and next-generation sequencing of HCV’s hypervariable region was done to characterise viral quasispecies. The Indiana analysis for the first time used a new toolkit called Global Hepatitis Outbreak and Surveillance Technology (GHOST) to infer genetic relationships among HCV strains and represent transmission networks. Most HCV strains involved in the Indiana outbreak were genotype 1a (72%), followed by 1b (2%), 2b (5%) and 3a (21%). A quarter of people with hepatitis C had HIV co-infection, while 90% of those with HIV also had HCV. Phylogenetic analysis identified one major genotype 1a cluster that included 130 cases and two smaller clusters, all considered to be endemic. Overall, next-generation sequencing identified 23 transmission clusters that involved 70% of cases. Many people were infected with more than one HCV strain, including 20% with mixed genotypes. Based on these findings, the researchers concluded that while the HIV outbreak was new, the large number of “co-circulating” HCV strains indicate that hepatitis C had been introduced into the community multiple times over a period of several years. Considering the lessons learned, Dr Brooks said that it was reassuring that the detection and prevention efforts put into place were “remarkably effective”, but it required enormous federal, state and local resources to halt an outbreak that was “devastating but entirely preventable”. Treating HIV is “our most effective means of prevention”, he said, and for those with addiction issues “we can keep needles out of people’s arms if we can get them on medication-assisted treatment” using methadone or buprenorphine. Further, studies have shown that syringe exchange programmes reduce HIV incidence among people who inject drugs by 56%, while opioid substitution therapy does so by 64%. While there has only been one known case of a person who initially tested HIV-negative and became positive since efforts to control the outbreak have been underway, it is “a reminder that that we have to keep such efforts in place or else it will bubble back up,” he added. Brooks JT The evolving epidemiology of HIV infection in persons who inject drugs: Indiana 2015. 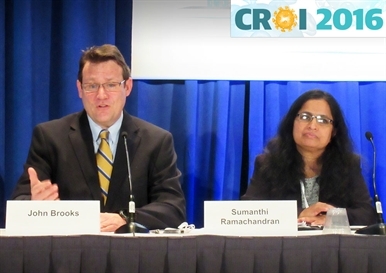 Conference on Retroviruses and Opportunistic Infections (CROI), Boston, presentation 132, 2016. Ramachandran S et al. Networks of HCV transmissions among persons who inject drugs: Indiana, 2015. Conference on Retroviruses and Opportunistic Infections (CROI), Boston, abstract 149, 2016.